When I garden, I don’t carry my phone. I leave it in the garage if I need to snap a photo, but if anyone is trying to get me they can wait a little while – kind of like the old days. 🙂 I like simple so I enjoyed this post. Happy Summer Days and Fourth of July! How are you my dear friend? I miss you! Two more years of teaching and I will be able to retire. I am looking forward to my time to do more art! I love your posts and your writing paints pictures! Julie, I still remember celebrating a 4th of July with you in Minnesota so long ago. We all sat on a hillside watching the fireworks displays from several cities all at once. It was magical! My cousin, Beverly Lewis, has made her fortune writing novels about the Amish. I have to admit, I haven’t taken to her writing style so haven’t read very many of the books. I know there is one that she dedicated to my sisters and me. Not sure which one that was. My father would take Beverly to task for claiming in her bio that his mother, our grandmother was Amish. More likely she was Mennonite, not Amish. Sounds like a lovely spot to vacation for your anniversary. Enjoyed all your photos. That’s so interesting, Marcia! I will have to look for your cousin’s books at our library. I do want to read some novels set in Amish communities! We passed several Mennonite churches in the area, as well. Many of the photos were taken from the car window as we followed the buggies. 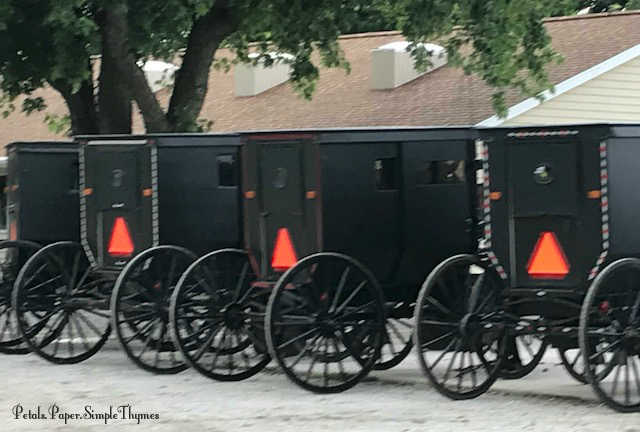 I tried so hard to respect their privacy, since the Amish people do not want to be photographed. Visitors are welcome to photograph Amish things, but not the Amish people. Thanks for the lovely photos of the area around Arthur, it’s one of my favorite places to visit and it’s been several years since I’ve been able to go down there. Rockome Gardens is gone now, it was a wonderful, quirky place with beautiful flower beds and odd little buildings made of old bottles and other odds and ends. Then there is Amish Swiss cheese, my absolute favorite and it’s been far too long since I’ve had any. 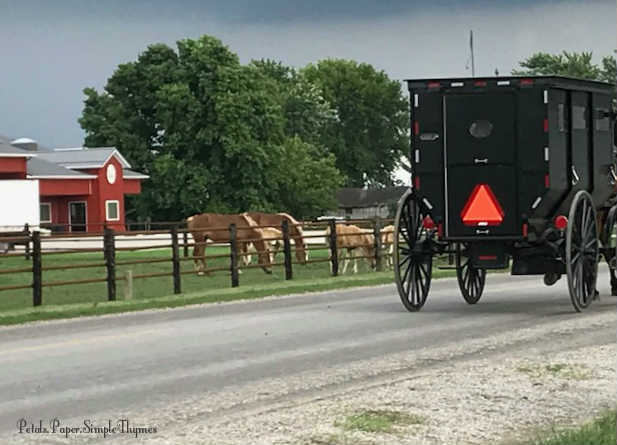 I remember the first time I was driving to Arthur and all the Amish on their bicycles would lift a hand in greeting and returning the gesture would generally result in a smile, those driving the carriages would do the same. Such a simple thing it’s a shame more people don’t do it everywhere. I like the simplicity too. Modern society is so full of complex, attention commmanding things which really aren’t all that necessary to our well-being. Have a lovely summer. Dawn, I really enjoyed traveling with you to the Amish town of Arthur near you two! How wonderful to celebrate your anniversary in such a special way. Happy Anniversary to you both as you continue your lives together! 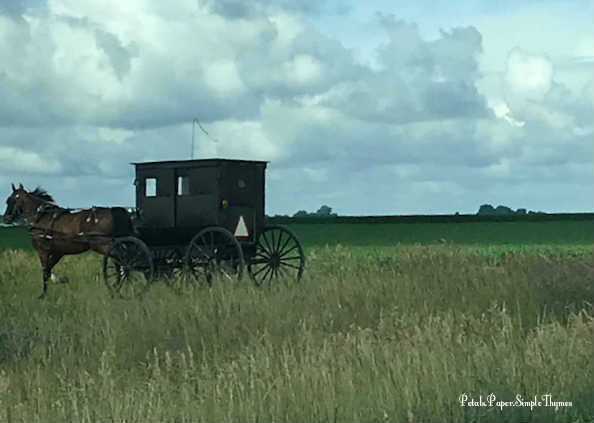 The lifestyle of the Amish has always interested me. I have great respect for their quest to lead a simple life. I must admit on this really hot, humid day, I would greatly miss the convenience of air conditioning! Years ago we visited Lancaster County in Pennsylvania. You probably are familiar with its large Amish community. Thank you for sharing your lovely photographs of the beautiful horse and buggies and farms. The clouds are just strikingly beautiful. 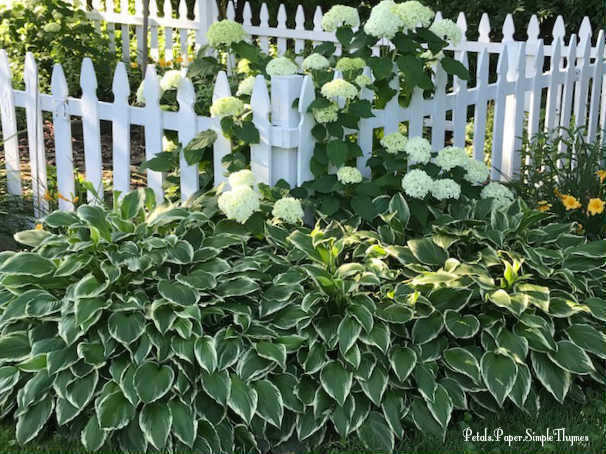 Your Annabelle Hydrangea is gorgeous along with the hostas in front of your beautiful picket fenced garden. Heartfelt thanks for your sweet wishes, Martha Ellen! It was a perfect 10th Anniversary celebration. (Newlyweds forever!) So, it was especially interesting to learn about Amish wedding traditions during our visit. We would love to drive out to Lancaster County one day. I would love to hear all about the trip that you and Grayden took there. The clouds were ever-changing and just amazing the entire time. 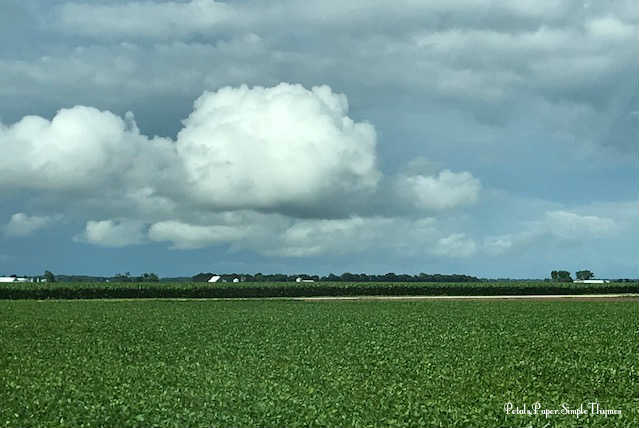 It was such a wonder that the rain stopped when we arrived in Arcola, since storms were predicted for our entire visit. We always had our rain gear ready, just in case. I’m so glad that we didn’t cancel our plans! Now that we have visited this area in the Summertime, we are planning for another visit in Autumn. We still have a long list of ‘must see’ places that the local people suggested. So, we must go back! 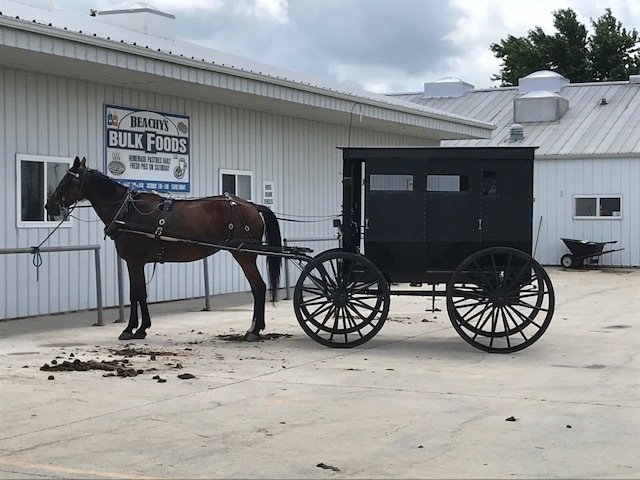 It makes my heart swell, Vicky, whenever I spend time visiting an Amish community! I truly admire their strong work ethic, close family bonds, and their strong sense of community. I think that is why I fell in love with Amish quilts in my late 20s. Ever since, I have had several small Amish quilts hanging on my walls. Each time I stop to admire these beautiful, handmade quilts on my walls, I reflect upon simple, quiet times. I’m very grateful for these reminders, especially when times get busy, unsettled, and difficult to comprehend. 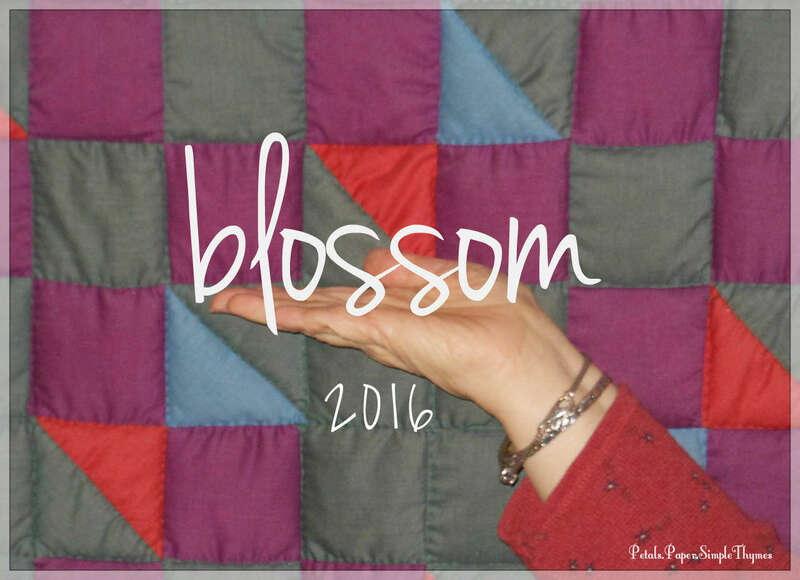 Amish quilts overflow with warm comfort and simple, quiet beauty. I’m certain that my love for piecing bits of colorful paper to create handmade cards is inspired by Amish quilts! Whenever I get together with my crafty ‘tribe’ for a whole day of papercrafting and friendship, it always has the feel of a contemporary ‘quilting bee.’ We are a group of talented women who have become good friends over the years as we create little works of ‘heart’ to bring comfort and joy to others. My home is decorated with simple antiques ~ oil lamps, stoneware crocks, washboards, kitchen tools, quilts, an Amish rocking chair, old wooden tables and other treasures. The Amish people use these things in their daily lives. For me, they are very useful reminders to slow down, notice the small moments in each day, and to reflect on the simple, quiet beauty all around me. 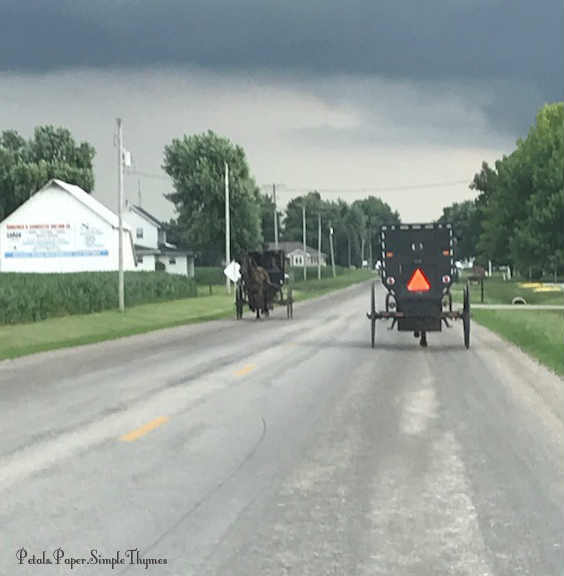 Although I would never want to give up my individuality, world-travels, and all of the opportunities I have had to learn, grow, and make a difference, I have always respected and admired the Amish people… and all that I learn from visiting them! Dear Dawn, a post that takes me home! 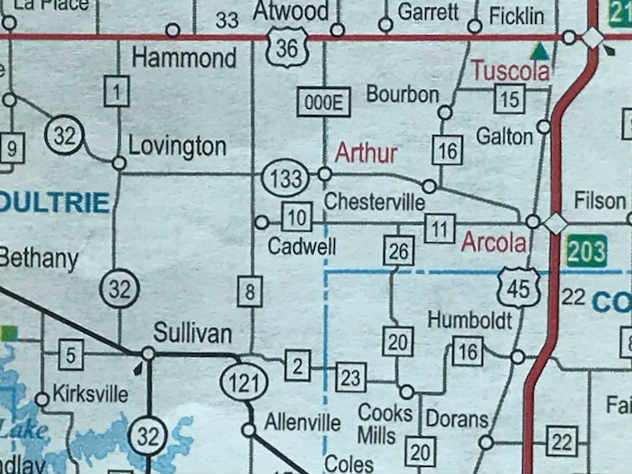 In Ohio I lived just 40 minutes from Holmes County. 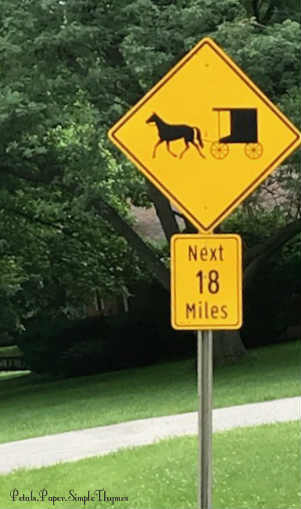 They boast the largest Amish community in the world. 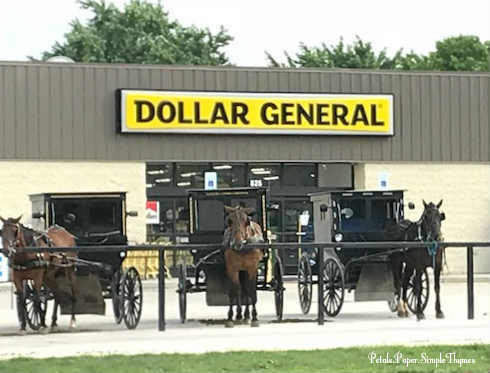 A few times I went to the Amish auction to purchase hay for my horses, just across the street from the famous Lehman’s Hardware Store, that has gone from a local hardware store for the Amish, filled with non-electric appliances to a major tourist attraction. Personally, I loved it best 35 years ago, before all the expansion. But the area is still lovely, with those same quiet farms. Lumber and furniture building are major Amish industries in the area. And the restaurants, run mostly by Mennonites…best food in the world! Jim and I always took a trip down through Amish country every time we were home. We never grew tired of visiting there! 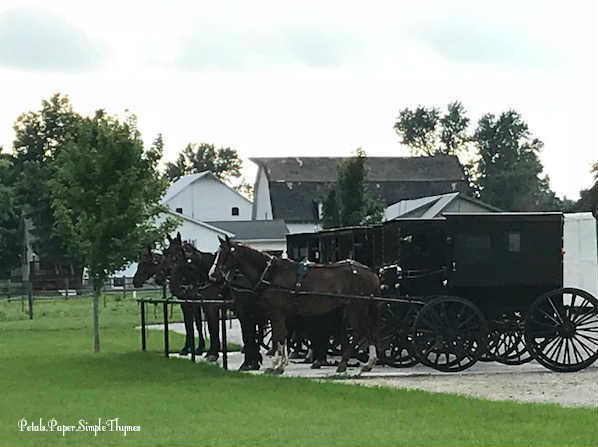 I think we all admire the simplicity of Amish life, and their “hands to work, heart to God” philosophy. And I think how wonderful that they don’t have to listen to the cacophony emanating from a television. But like Martha Ellen, I am not ready to give up air conditioning or my washer and dryer! Thanks for taking me home briefly! ❤️ And Happy 4th! Oh, Chris! I just love hearing about your ‘Home Sweet Home’ days in Ohio! Thank you for telling us about the Amish community in Holmes County. 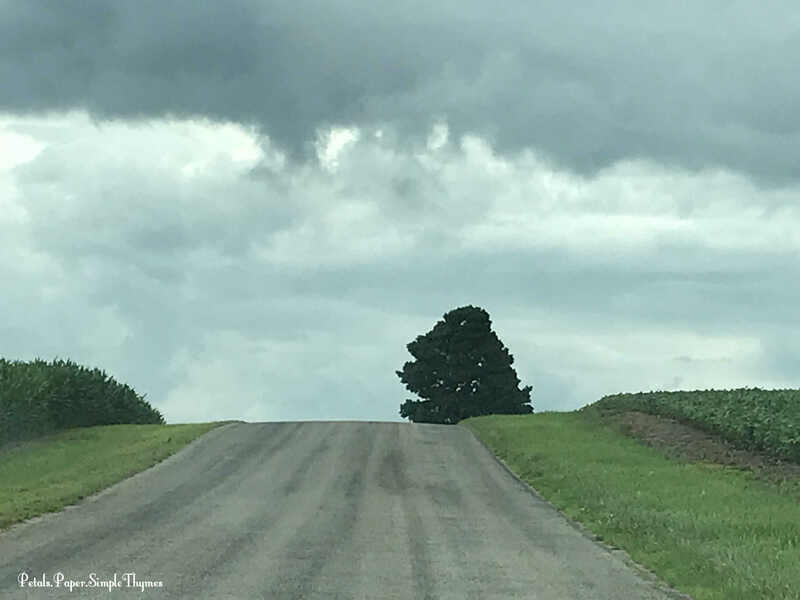 I haven’t looked at a map yet, but I’m thinking that it might be a wonderful road trip ~ from Illinois, through Holmes County, and on to Lancaster County some day! 🙂 So much to see and learn! Simplicity speaks to our hearts as our lives grow busier and more complicated. We have a sign hanging in our kitchen (just above the microwave 🙂 ) reminding us to “Live Life Simply” each day! 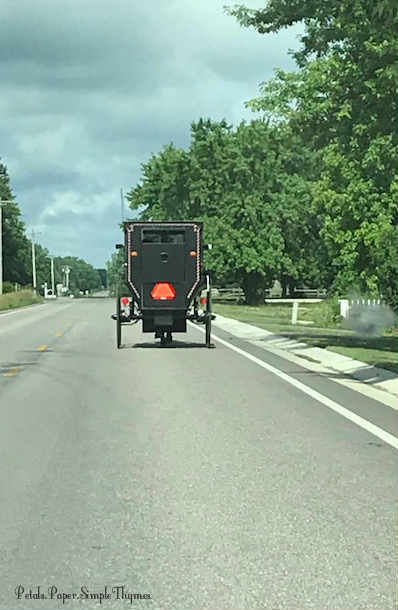 While I pass through Amish settlements in northwestern Wisconsin, we’ve not visit Arcola and the surrounding area. After reading your words and seeing you photos (which are lovely), I will make a point of visiting the Amish area, Dawn. Happy and safe 4th of July! PS – We wil be having dill pickles today from Amish. Your post made me nostalgic! I used to live in Amish country, in northern Michigan, before we moved to Houston. I miss shopping at their bulk food stores–with organic fruit, home made treats, and really good prices! Dawn, in the 90s I became so engrossed with the Amish, their beliefs and lifestyle, that we visited their communities in PA, OH, and IN. I loved going off the beaten track and stopping at their farm stands. I also read just about every book our library had about them, and even subscribed to their monthly magazines for a year. They are terrific story tellers. One fiction book I highly recommend is Rosanna of the Amish by Joseph Yoder. It is an old book (1940). I also loved Sue Bender’s books about her time spent with the Amish. You did a lovely, accurate account of them in your post. 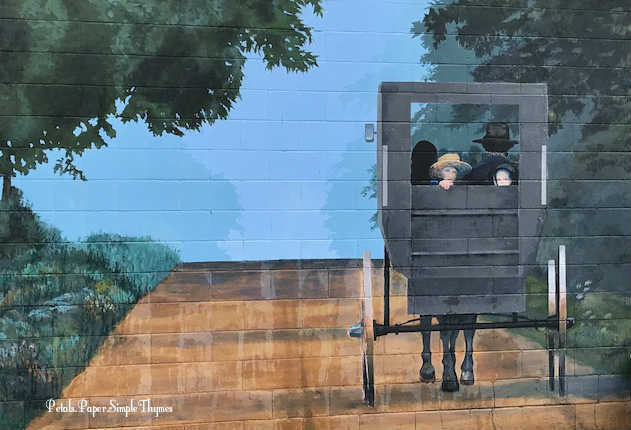 We are only 2 hours from the Lancaster PA Amish, but it has become a tourist attraction and I do not recommend it except for the museums about the Amish history and lifestyle. Marlene, I try to carry the ‘clip-clop’ sound of the Amish buggies in my heart always. 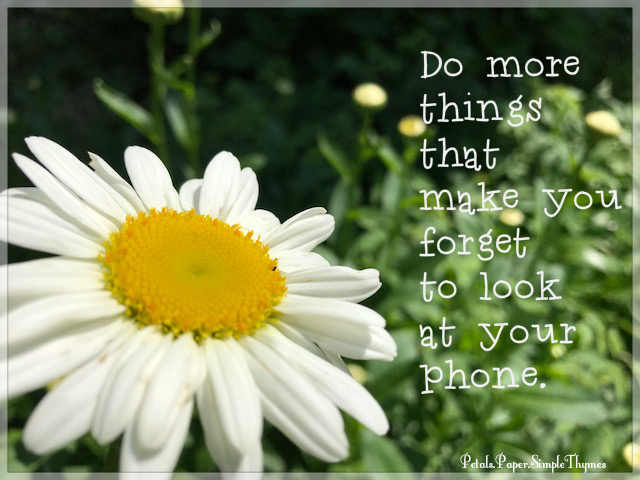 ♥ It’s an important reminder to slow down and try to be present in the moment. I am in the habit of carrying my phone, too, but I mainly use it to take photos. 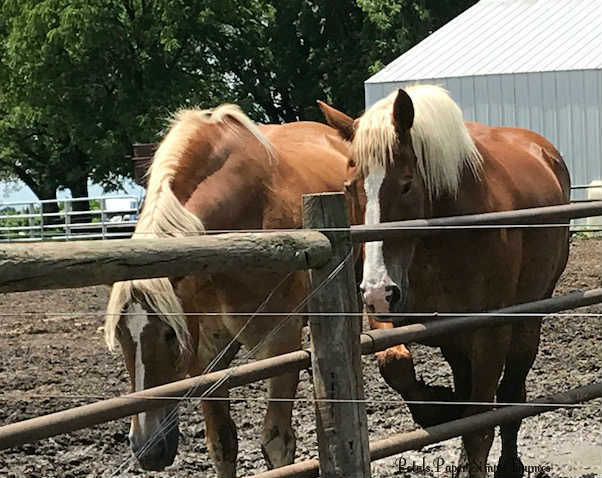 🙂 We truly loved our days in Amish Country and can’t wait to return. Wouldn’t it be lovely in the Fall? 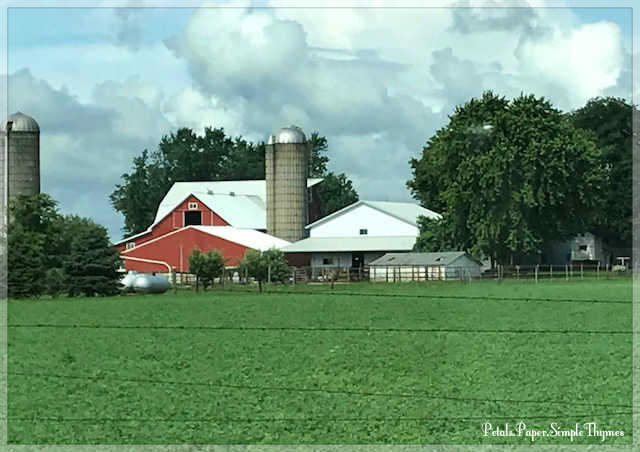 I long to see the quilts airing on the clotheslines as we pass the Amish farmhouses. 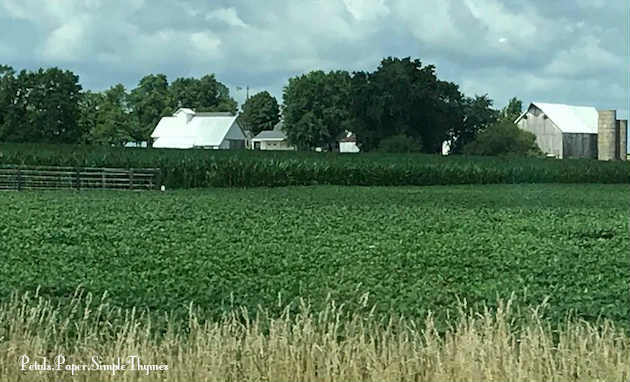 🙂 I think you will enjoy digging deeper into some fascinating places we visited in Illinois Amish Country, Marlene! No rush, Dawn. Everything has it’s right time.